On April 29, the Department of the Interior’s Bureau of Safety and Environmental Enforcement completed a process six years in the making: developing comprehensive safety regulations in response to the Deepwater Horizon blowout disaster in 2010. The initial explosion aboard an oil rig in the Gulf of Mexico resulted in 11 deaths and the discharge of more than three million barrels of oil. Last year, NSPE submitted a public comment commending the BSEE for its proposed rule to require a licensed PE in cementing and casing situations to examine, review, approve, and certify changes or remedial measures as part of “Oil and Gas and Sulfur Operations in the Outer Continental Shelf Blowout Preventer Systems and Well Control.” This final rule accepts and formalizes these requirements. 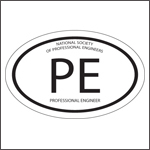 NSPE commends the Bureau of Safety and Environmental Enforcement for enacting this critical change and recognizing the key role the licensed PE plays in protecting the public health, safety, and welfare.